HELSINKI, FINLAND: Helsinki is a vibrant and diverse city, where you can taste traditional eastern exotic with contemporary Scandinavian style. 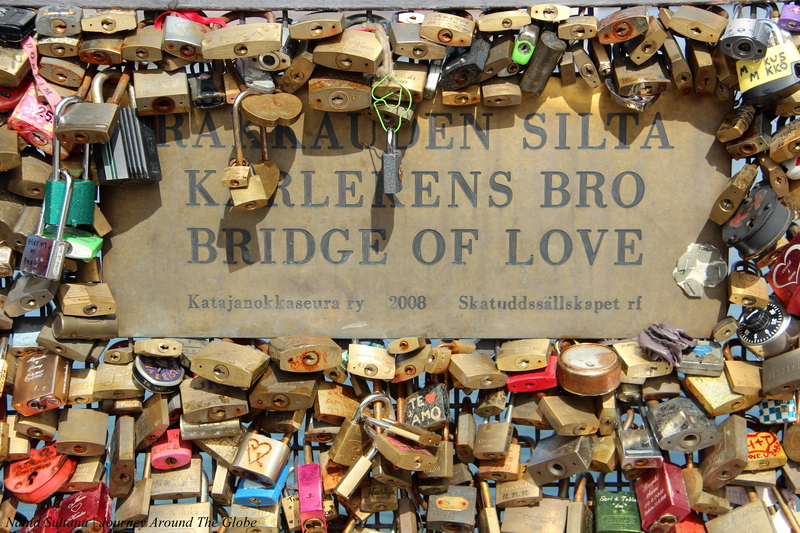 It’s the capital of Finland and the second-most northern capital city in the world. This youthful and relaxed city gave us a cosmopolitan experience which exists in perfect harmony with nature. 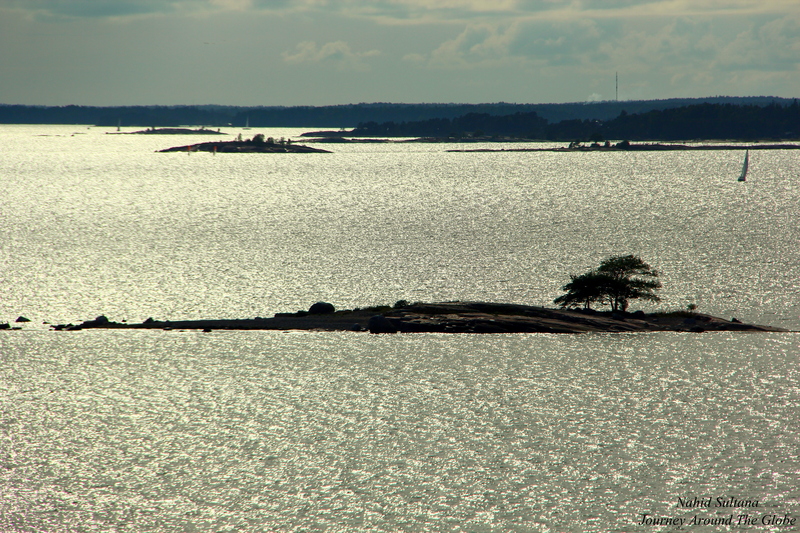 With more than 300 islands and 100 km of coastline you can’t go wrong when spending time outside the city also. The city was founded in 1550 by a Swedish king. Later, Helsinki was under Russian tsars for many years, therefore, you will see lots of influences of Russia here from architecture, to food, and souvenirs. We toured the city with Hop On Hop Off (not the red one, green buses) open top tour bus service of Helsinki. We found their representatives right after we got off our ship. It was raining badly, I mean…seriously, it wasn’t a fun rain. We quickly decided to get on their bus to escape from the rain and it was the best way to explore Helsinki in that weather. They charged us 25 Euros per adult and free for kids below 16 years which includes audio guide and is valid for 24 hours. Also, you get to be picked up from your cruise terminal, if you arrive to the city via sea. EATING and SHOPPING: Helsinki’s cozy outdoor cafes and terraces offer a pleasant way to rest your feet and refresh yourself. For gastronomical explorer Helsinki has plenty to discover. We saw plenty of nice restaurants in the main center, near Senate Square. But, we grabbed some Subway sandwiches from a shopping mall and went on with our journey as soon as possible. For souvenirs, Market Square was our best option. They were very reasonably priced and had tons of options to buy something local. 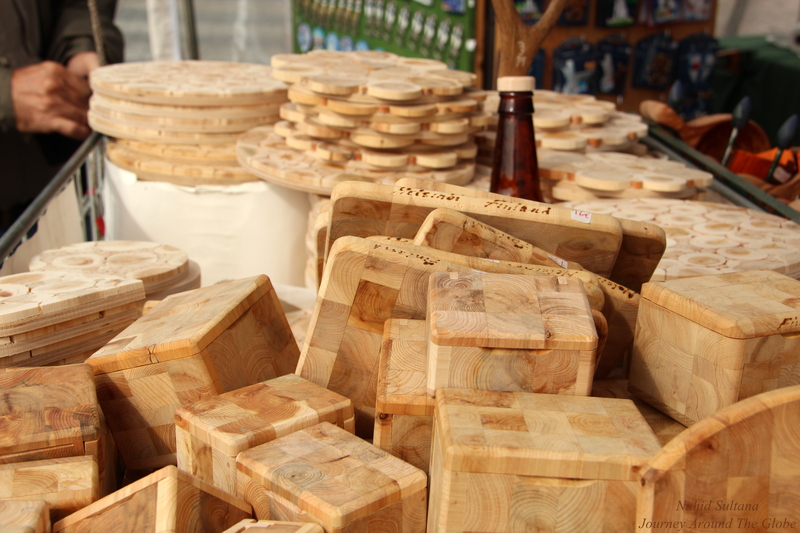 We bought a pair of coasters made from juniper trees, it was 10 euros each. The wood has a distinct smell and the man told us if you put hot dish on the coaster, you can really get the smell of juniper. PLACES WE’VE VISITED: There are plenty museums here if they interest you…but with our short time off of the ship, that’s all we could do and visit here. Also, the rain didn’t help at all. We opt out on Olympic Stadium that is a well-known tourist spot where Olympic Games were held in 1952. We managed to visit the following in about few hours. Most of the sights and attractions are within walking distance in the city center, and getting around town is very easy. But Hop On Hop Off was a life saver for us that day. 1) SENATE SQUARE and HELSINKI CATEHDRAL: This is the main central square in Helsinki and a reminder for Finnish people when they became independent in 1917, immediately after the Russian Revolution. This neo-classical historical center is where we were dropped off at first from the port. In the center of Senate Square stands a statue of Tsar Alexander II from 1894. This Russian tsar was very popular here and his bold statue in the square represents Law, Peace, Light and Labor. Many merchant houses from the 18th century are lined on the south side of the square. Senate Square also houses few museums, university library, main university building, and official residence of the Mayor of Helsinki. It was raining cats and dogs; we had to change our bus here and get on another Hop-On Hop-Off to start the tour. 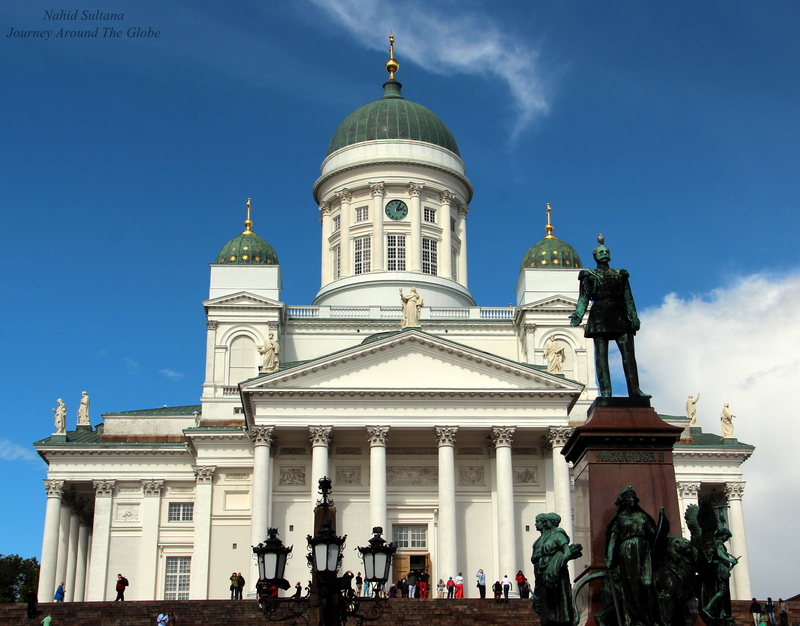 The beautiful and historically significant Helsinki Cathedral is an Evangelic Lutheran church. This striking white cathedral with green dome is the unofficial symbol of Helsinki and has been dominating Senate Square since 1850. Russian Tsar, Nicholas I, contributed to the exterior appearance of this cathedral by commissioning the zinc statues of 12 apostles on the roof looking down at the world. Helsinki Cathedral hosts major state and university events. Inside is very simple but elegant. The altar is non-decorative too, but the choir is grand and beautiful. Exhibitions and concerts are held in the vaulted crypt. Be ready to climb 50+ steps to get there. Entry is free to the cathedral. 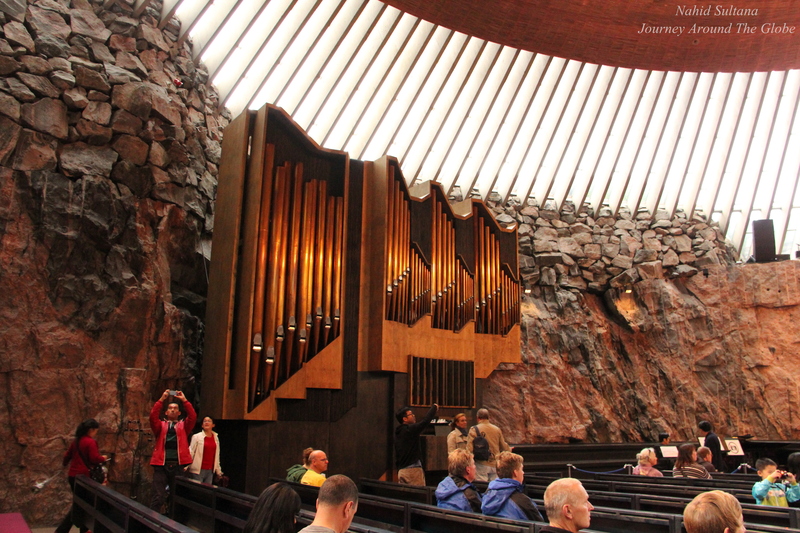 2) TEMPPELIADIO CHURCH or ROCK CHURCH: This Lutheran church was literally dug out of solid rock and is the most visited site in Helsinki. It was quarried out of the natural bedrock where the interior walls are created naturally by the rock. The roof is made of 22 km of copper strips. Completed only in 1969, inside the church is very contemporary with simple altar and nave. Due to its excellent acoustics the church is a popular venue for concerts. There is no fee to enter the church. 3) SIBELIUS MONUMENT: Dedicated to the world-famous composer Jean Sibelius, this monument is one of the “musts” when visiting Helsinki. 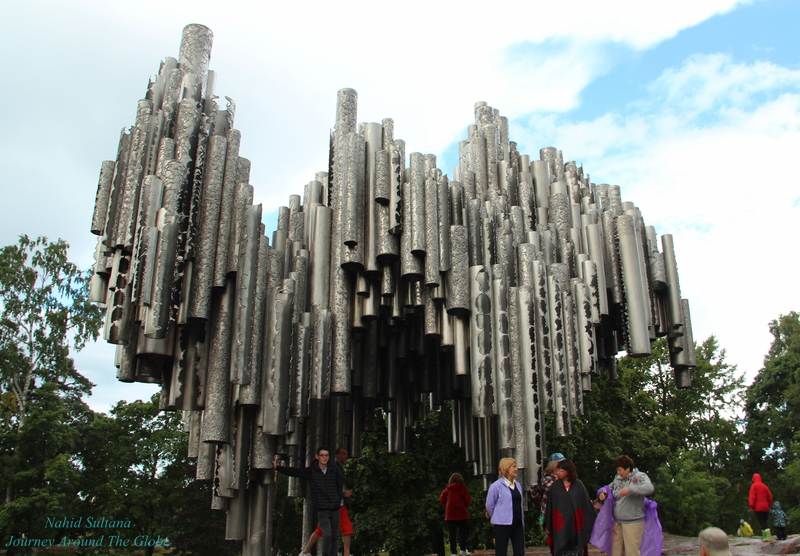 Located in Sibelius Park, this unique sculpture resembles organ pipes, made with welded steel with the bust of the composer on one side. It has over 600 pipes and weighs 24 tons. This is a very nice park with touch of lovely greens in the city. There is no charge to enter the park or to see the monument. 4) NATIONAL MUSEUM, PARLIAMENT HOUSE, and HELSINKI MUSIC CENTER: Although we didn’t go inside because of short time, National Museum of Finland is a place full of treasures. It illustrates Finnish history from prehistoric times to the present and the building is very bold too. Only a few steps from the museum is Finland’s impressive parliament building. The façade is made of red granite with 14 Corinthian columns. Opposite of the parliament if the Helsinki Music Center. 5) MARKET SQUARE: This was my favorite place in this city…I do get excited when choosing or buying souvenirs. Market Square is located in front of the city hall and by waterfront, only couple minutes of walk from Senate Square and Uspenski Cathedral. It was a great place to do some souvenir hunting. 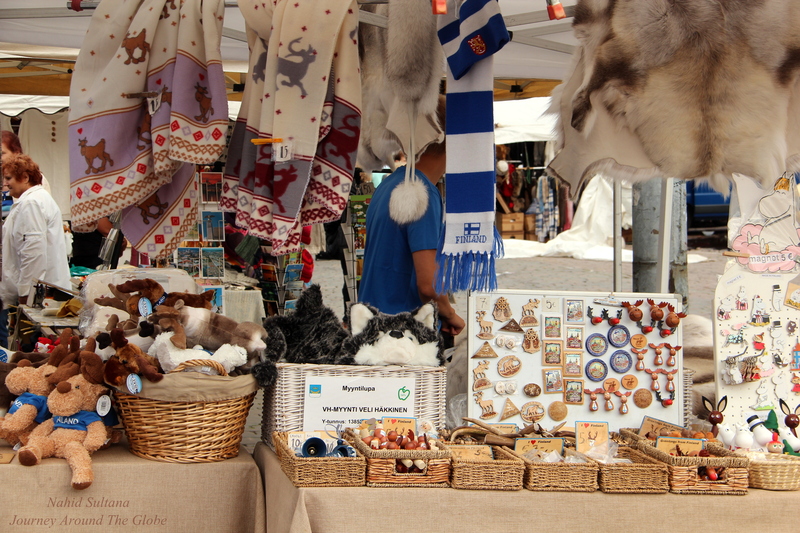 You can find some unique Finnish items here like juniper wood coasters and boxes, minks, fox furs, sweaters, and winter accessories and best part is that they are all made in Finland. 6) USPENSKI CATHEDRAL: Completed in 1868, the Uspenski Cathedral is the largest Orthodox cathedral in Western Europe. 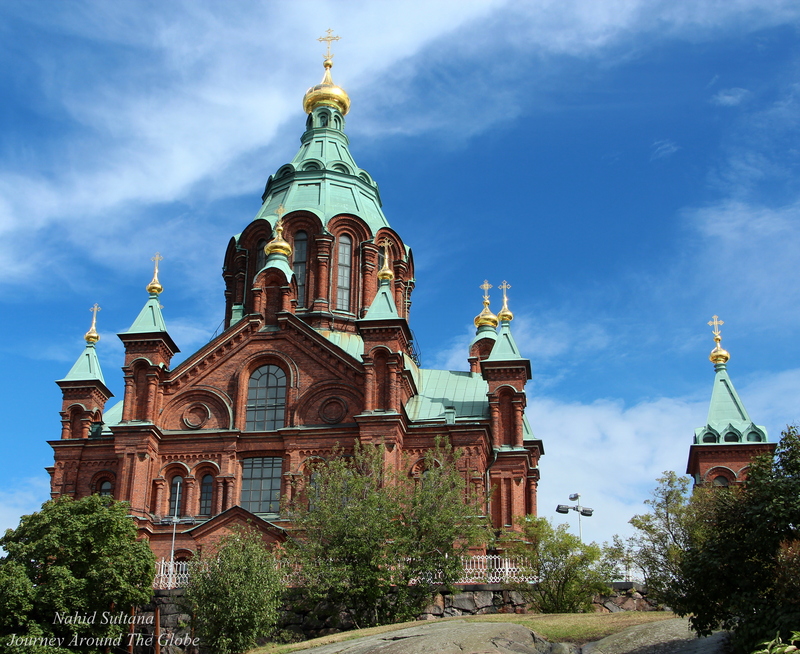 With its golden copulas and red-brick façade, the church is one of the clearest symbols of the Russian impact on Finnish history. This is one of the two official national churches in Finland. The ornate vaults are supported by four giant granite columns. And the fabulous painting behind the altar was done by a Russian artist. Interior is kind of small but more gorgeous and decorative than Helsinki Cathedral. We had to climb a small hill with few stairs. It’s free to go inside. With classic onion-domed Russian church is prominently located near Market Square and only 5 minutes of walk from Senate Square. Your photos presenting Helsinki are stunning. What a pity that You did not have time to visit some nearby small towns which have old wooden houses! What a beautiful city. The cathedrals were so lovely, would love to attend services in that rock church, and the organ pipe monument really caught my eye. I hope you realize how lucky you are! You managed a fair bit of the central places in only a few hours! Good pics, and fun to read a tourists view of the home town 🙂 Welcome back for more! Nice place . I love the picture with the locks. It has any meaning?